This mosaic of Cerealia Facula inside the dwarf planet Ceres' Occator Crater is based on images obtained by NASA's Dawn spacecraft in its second extended mission, from an altitude as low as about 21 miles (34 kilometers). You may have seen the bizarre bright spots speckling the dwarf planet Ceres — but not like this. 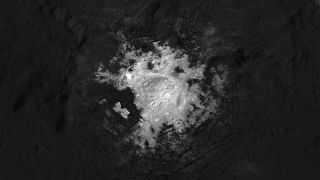 NASA's Ceres-orbiting Dawn spacecraft has captured jaw-dropping new photos of several of the bright-white features, formally known as faculae, that lie at the bottom of the dwarf planet's 57-mile-wide (92 kilometers) Occator Crater. "The new images of Occator Crater and the surrounding areas have exceeded expectations, revealing beautiful, alien landscapes," Dawn principal investigator Carol Raymond, of NASA's Jet Propulsion Laboratory (JPL) in Pasadena, California, said in a statement yesterday (July 16). The $467 million Dawn mission launched in September 2007 with a bold goal: to orbit and study the two largest bodies in the asteroid belt: Vesta and Ceres. Both objects are considered leftovers from the solar system's planet-formation period (hence the mission's name). Dawn reached Vesta in July 2011 and eyed the object up close for more than a year, finally leaving for Ceres in September 2012. Dawn discovered the Occator Crater bright spots during its approach to Ceres in early 2015, and later found a number of other crater-associated faculae around the dwarf planet. The probe's observations have since revealed that the bright spots are salty deposits, composed primarily of sodium carbonate and ammonium chloride. Scientists think this material was left behind when briny water boiled away into space, but they're not sure where, exactly, those brines came from — specifically, how deep underground the reservoirs were. Dawn team members are using the probe's observations to tackle this and other questions about the 590-mile-wide (950 km) Ceres. Some of the most intriguing data and eye-popping photos come from Dawn's most recent mission phase, during which the probe has circled above Ceres at an altitude of just 21 miles or so. Dawn spiraled down to this superlow orbit early last month and will remain there through the end of its operational life, which is expected to come in a few months. The spacecraft is nearly out of hydrazine, the fuel that powers Dawn's small orientation-controlling thrusters. When the hydrazine is gone, Dawn will be unable to point its science instruments at Ceres, or its communications gear at Earth. The Dawn team is presenting the results from the latest (low-orbit) mission phase this week at the Committee on Space Research conference in Pasadena.